The building is being demolished, not the church. This was actually not the last worship service before demolition. They will continue to worship at 716 S. Glebe Road in Arlington, VA and the building won’t be razed for several months. It’s not that I don’t believe that churches can be demolished. It’s just that I believe that machines do not demolish churches; people do. It’s a common mistake. 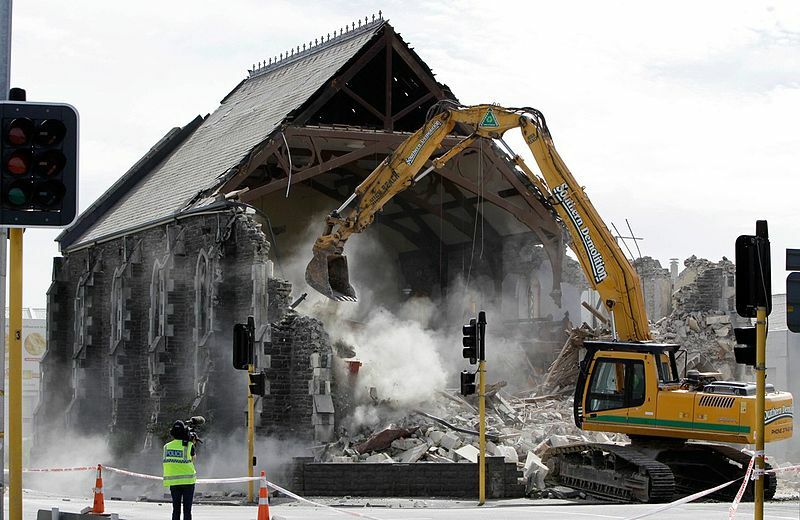 The image above is from the demolition of the Sydenham Heritage Church building near Christchurch, New Zealand, but the article describing this event calls it the “church demolition.” Again, the church was not demolished. The building was demolished. We gossip about each other to the point of creating a false narrative about a person or a group of people. We fear change to the point of demonizing people who seek faithful transformation. We shame and blame people who disagree with us. We lose sight of why we first gathered as God’s people and we shift from worship community to private club. Sometimes – prior to demolition talk – I hear “closing talk” as in: “The Presbytery is trying to close our church” or “That pastor was brought in to close our church.” Again, this is usually misinformation. What’s actually true is that a church has been choosing to close for many years now. They chose to close when they called a part-time leader to save money, even though they could have afforded a full-time pastor. They chose to close when they stockpiled their financial resources for a rainy day and didn’t notice it was pouring outside. They chose to close when they allowed one or two powerful church members to bully other church members with no repercussions. They chose to close when they consistently allowed fear to win over faith. They chose to close when they loved their building and property more than they loved Jesus. I understand when the secular press gets it wrong and believes that a bulldozer can demolish a church. But it’s less understandable – or acceptable – when we human beings demolish our churches. Note: This post is dedicated to Arlington Presbyterian Church that used to worship on Columbia Pike in Arlington, VA. They will worship there again in the future. Thank you, Jan, sort such a great article. May I post it on my church’s website (of course, attributing it to you)? Thank you, Jan. Very well done!